What is the North Plains Water Conservation Center (WCC)? What is the WCC? In 2014, the North Plains Groundwater Conservation District began focusing the North Plains Research Field at Etter, Texas, as the North Plains Water Conservation Center. The board of directors developed a plan for the operations and staffing of the Center, including articulating the mission as a demonstration field and upgrading the facilities. The board of directors then selected Stan Spain and Crop Production Services (CPS) out of five proposals to oversee the farming and demonstration at the Center. CPS management demonstrated a vision for the Center that matches the vision of the board, making the company an excellent corporate partner for the District. 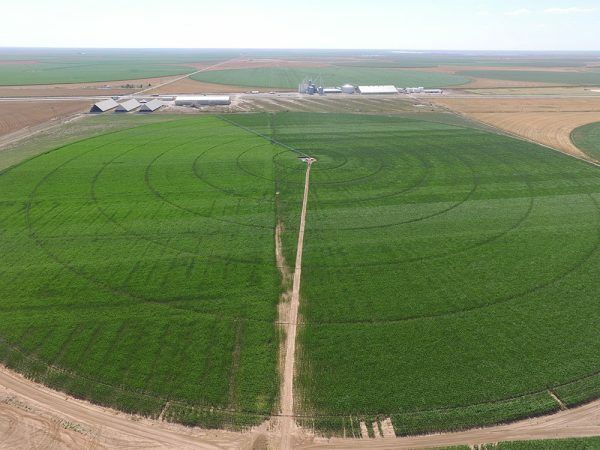 CPS spelled out a plan of demonstrating graduated irrigation regimens of 3, 4, and 5 gallons per minute pumping capacity to simulate the conditions faced by most producers in the district. To read more information on the “3-4-5 Program”, click here. Space was also set-aside for demonstration of the District’s award winning “200-12 Project”. CPS also plans to demonstrate various plant populations as well as multiple crops and crop rotations in their demonstrations at the field including: corn, cotton, sorghum and wheat. These plans are in line with the water conservation focus that the board of directors wants for the Center, but the potential for ongoing coordination with the District in the design and implementation of demonstrations while allowing the District access to all the data is of great value to District stakeholders as well. In addition to the agriculture conservation demonstrations to be conducted by CPS, the District maintains the Water Conservation Center as a showcase for a variety of conservation practices and innovations. Future demonstrations could include low water use landscaping, rainwater harvesting and gray water reuse. If you are interested please contact our office at 806-935-6401 or e-mail us at info@northplainsgcd.org.